Small courtyard gardens are often the most difficult to design, but when you get it right the rewards are always outstanding. The owners of this Victorian era worker's cottage were undertaking major renovations. They maintained the look of the front facade and extended the home towards the back. The extension was to include a new bathroom, kitchen and living room on the ground floor, plus a new first floor housing new bedrooms. Avid gardeners, they didn't want to loose their garden space and wanted the opportunity to live outdoors. This was going to prove a little difficult as the new extension swallowed up most of the garden space. The key was to make the most of what remained, both in terms of green space and paved areas for relaxing and entertaining. We also had a slight issue with the levels. There was a 400mm drop from the back door to the utility space threshold. As luck would have it, 400mm is roughly seat height (leaving enough room for cushions). The solution to both the level problem and the lack of entertaining space was to create a dual purpose deck. 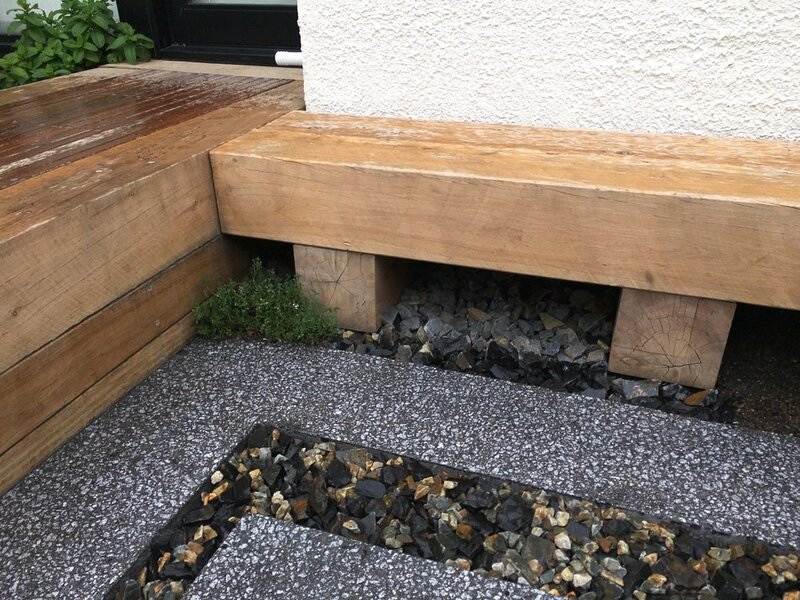 The deck bridges the gap and height difference in the garden, whilst providing extra seating in the courtyard. We then built a timber bench to match the deck and add more seating - somewhere to perch and enjoy the garden. The new extension had a modern Japanese flavour, which the owners liked and they wanted that reflected in the garden. With this in mind, I chose to use honed concrete and basalt rocks as the pavement. The honed concrete was laid in a geometric pattern with a hint of the Fibonacci sequence being enlisted to ensure the pattern was balanced and felt relaxing. The owners also wanted a productive garden, so we installed a Persimmon as the feature tree and narrow Apple trees to screen the garden from the harsh afternoon sun. The low planting is a combination of herbs and perennials to provide both produce and flowers. The clients also wanted a moss wall and fish pond, so I combined both wishes into one feature, the pond reticulates up to the moss wall. The fishy water keeps the moss and ferns constantly moist and fertilised and in turn, the moss wall removes some of the toxins from the pond. 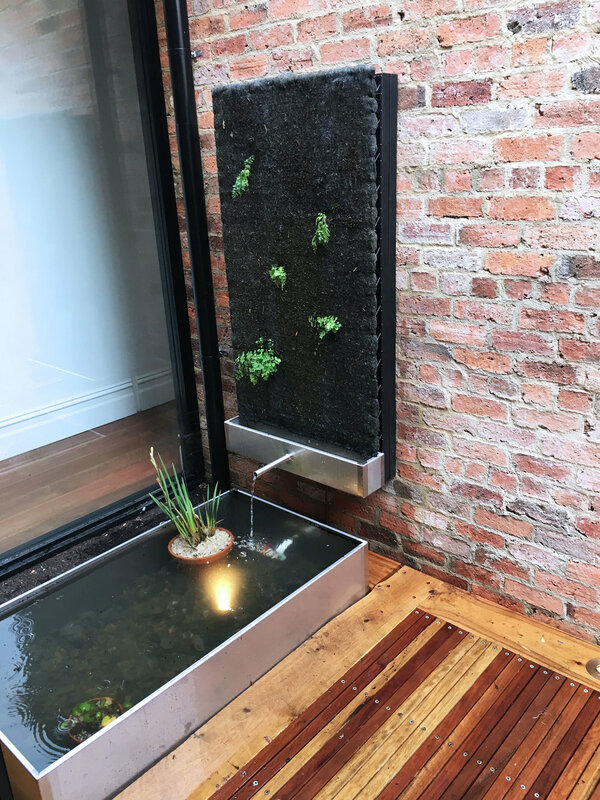 The lightwell also allows access to the bathroom through the garden, so we continue the theme of paving through the space to connect the lightwell to the back courtyard.